The run-prevention Red Sox were supposed to have trouble hitting for power this season. But they went into last night’s game against the Baltimore Orioles third in the American League in home runs, then hit three more. “I’ve been shaking a lot of hands,’’ third base coach Tim Bogar said. All three shots were needed as the Sox survived another bout of shaky pitching and defense to beat the woebegone Orioles, 7-6, before 38,017 at Fenway Park. A six-run seventh — their biggest inning of the season — gave the Sox a 7-3 lead and a seeming respite from what has been a series of tumultuous and tight games. 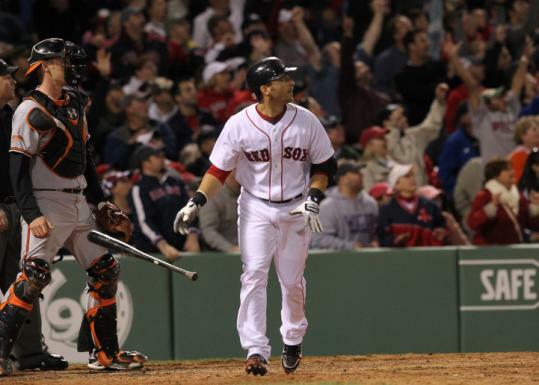 Marco Scutaro hit a three-run homer before Kevin Youkilis did the same three batters later. Both home runs were to left field and gave the Red Sox 24 on the season. Only the Blue Jays (26) and White Sox (25) have more. Francona hoped to give Jonathan Papelbon a night off. But after Adam Jones homered and Nick Markakis doubled to center off Ramon Ramirez, the closer was called in. Singles by Miguel Tejada, Matt Wieters, and Luke Scott cut the lead to one run. But Papelbon struck out Ty Wigginton and Rhyne Hughes to finally end the game. The Orioles lost despite 17 hits, four by Wigginton and two by Hughes in his major league debut. The Red Sox have won four of their last five games and can sweep the Orioles this afternoon. At 8-10, their poor start isn’t forgotten. But the Sox are starting to peer around the corner. The 2-16 Orioles have lost five straight and 14 of their last 15 games. The Orioles have lost 10 straight against the Sox and are 1-15 at Fenway Park since midway through the 2008 season. Rookie lefthander Brian Matusz took a 3-1 lead into the seventh inning, having allowed only five hits, including Jason Varitek’s fourth home run. The Sox loaded their lineup with righthanded hitters against Matusz. Varitek was the catcher with fellow switch-hitter Victor Martinez the designated hitter. Bill Hall started in right for the first time and Mike Lowell was at third. Such was the respect the Red Sox had for Matusz, despite last night being only his 12th start in the majors. The Orioles spent their day off in Boston Thursday after flying in from Seattle. Matusz, a 22-year-old lefthander, had never been to Fenway before and got teammate Jeremy Guthrie to catch the Rangers-Red Sox game with him. The idea, he said, was to try and get comfortable. That was the case until the seventh inning. After Hall worked a walk and Hermida singled, Matt Albers (0-3) came on and he immediately gave up the home run to Scutaro. Three batters later Kam Mickolio left a fastball over the plate that Youkilis hammered for his third homer. “We’re just trying to go out there and play game by game and be a little more consistent,’’ said Scutaro, who has two home runs. Sox starter John Lackey (2-1) was seeking atonement after allowing eight runs on nine hits over only 3 1/3 innings against Tampa Bay in his last start. The righthander was better last night, giving up three runs over seven innings. Lackey allowed 10 hits, walked two, and struck out three in seven innings. He threw 72 of his 111 pitches for strikes. Poor defense handed the Orioles their first run. Wieters led off the second with a single to left, the ball skipping right past Lowell at third. Scott followed with a ball off the wall. Hermida, who has had problems in left field, was too close to the scoreboard and the ball ricocheted over his head. Hermida stumbled to the grass trying to make the play and Wieters scored. Singles by Wigginton and Hughes pushed the Orioles’ lead to 2-0. Hughes was called up from Triple A Norfolk earlier in the day. His parents and brother made it to Fenway Park in time to see the game. Wigginton homered off Lackey in the sixth inning, giving the Orioles a 3-1 lead, one their bullpen could not hold.